What is your body missing? Your body needs L-Carnitine or "ALC" as it's commonly called, to burn fat and make energy in your mitochondria (structures within cells that convert the energy from food into a form that cells can use). So it's no surprise that adding Carnitine to your regimen will "re-charge" your mitochondria and fire up the energy in your heart, brain, organs and muscles. And that's not all. Researchers also found Carnitine helps lower your risk of complications from high blood sugar … reduce fatigue … ramp up the energy in your brain for better thinking and longer attention span… and it may even slow down the effects of aging. In a recent study, researchers looked at the effect that the nutrient L-Carnitine had on the heart. One group took CoQ10 and L-Carnitine daily for 12 weeks. The other group took a placebo. The group taking both supplements showed significant improvements in their shortness of breath and fatigue and they exercised better too. They exercised better, too. So if you have any type of heart, cardiovascular or energy concerns, it’s one nutrient that should be part of your arsenal. The degree of post-exercise soreness you experience after workouts is a major factor in your quest for lean muscle gains and better performance. If you’re often too sore from yesterday’s workout to get back into the gym today or tomorrow, how do you expect to improve? According to a new study conducted at the University of Connecticut and published in the Journal of Strength and Conditioning Research, supplementing with 1 to 2 grams of L-Carnitine daily while engaged in a resistance training program may diminish perceived muscle soreness and boost recovery after exercise. While L-Carnitine can be made in the body, it’s considered a conditionally essential nutrient that can exceed the body’s ability to manufacture enough. How would you like to have enough energy to do all the things you dream of doing? One of the best nutrients — alpha lipoic acid — can re-invigorate you and help you turn back the clock by 20 years or more. 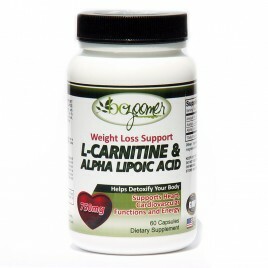 Studies show alpha lipoic acid may practically reverse aging. Researchers tested it against 100 detoxification and antioxidant genes in mice. When given alpha lipoic acid, "their cognitive ability, behavior, and genetic expression are comparable to that of young animals." The animals weren't just living longer, they were living better. How does it do it? Researcher at the Linus Pauling Institute, found that alpha lipoic acid restores levels of glutathione to that of a young animal. Numerous studies have shown that lipoic acid supplements improve insulin function and may also lower blood sugar levels and Lipoic acid also has potential weight loss applications, a benefit to overweight people with type 2 diabetes. Lipoic acid has been used to treat life-threatening liver diseases such as hepatitis as well as mushroom poisoning. A must for those looking for a great supplement to assist in Weight Loss.